Most people profess to not being able to tell Asians apart. Living in Europe, I have been the embarrassing recipient of confused Europeans mistaking me for an Asian acquaintance they saw briefly in passing. Then I met someone, a German, who was proud that he could unlike his countrymen and most of the world, could distinguish Asians apart and he guessed I was Chinese. When I said I wasn’t but Korean-American, the look of disappointment on his face almost made me sad to tell him he was wrong. Most people guess I am Chinese except for one Brazilian guy who guessed I was half-Chinese and when I asked why half, he answered, “then I would only be half wrong,” which I thought was the best strategy of all time. He eventually went on to Strategy consulting. 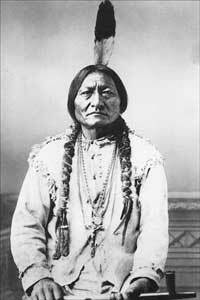 I can imagine myself growing old to eventually look like Sitting Bull pictured above with glasses. If I go senile, perhaps I’d even wear a feather. Then she motioned to her face and as nicely as possible said, “All the Koreans I’ve seen have had long faces like Japanese, and yours is… not.” Yes, I had the round mooncake face. Then I asked, “So most Chinese have round faces?” and she smiled and nodded her head yes.